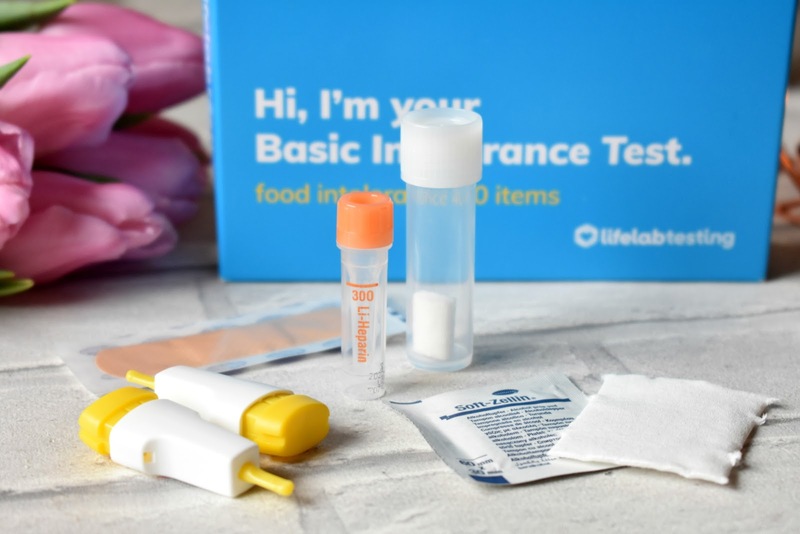 HaySparkle: LifeLab Testing Basic Intolerance Test + My Results! 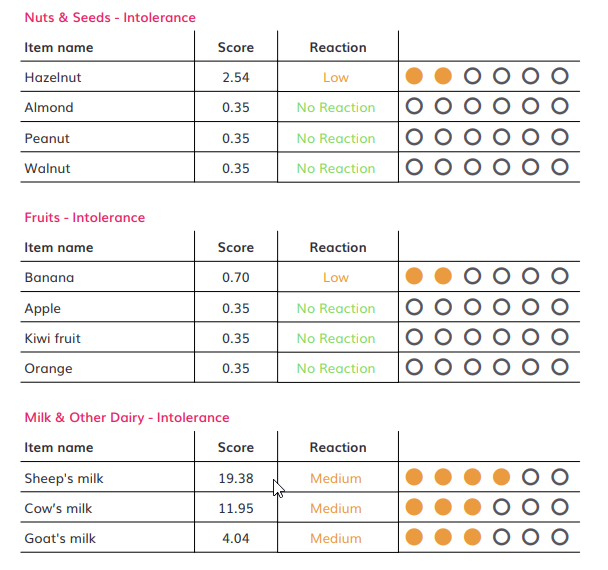 LifeLab Testing Basic Intolerance Test + My Results! Today I have something slightly different on the blog but something I was really excited in doing and writing! Recently LifeLab sent me over one of their at home blood testing intolerance kits and I actually couldn't wait to try it, it sounds strange to be excited about doing something like this but it came at the perfect time for me because my health hasn't been the best it could be over the last year or so, my acid reflux seemed to hit a huge high, more recently I've had problems with bloating and stomach pain which I've put down to acute IBS and I've been a migraine sufferer for years, all of these things combined had me thinking....maybe it's something I'm eating that's doing this to me, because food intolerance's can bring on all of these symptoms I suffer from! So now you can probably understand why I was keen on doing this test, because I'm hopeful that it could result in my health improving! 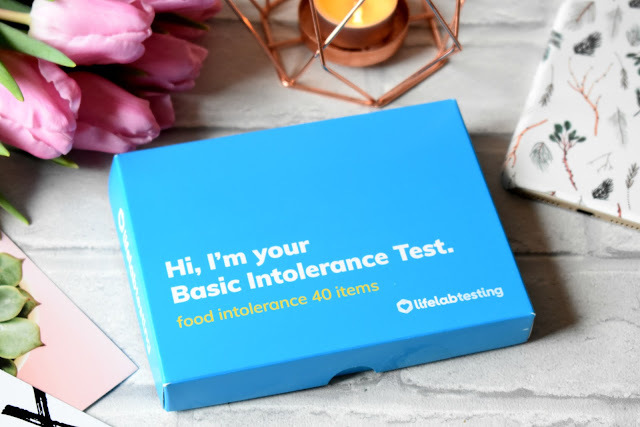 LifeLab Testing sent me their Basic Intolerance Test* which analyses your blood sample against 40 of the most common intolerant foods including seafood, nuts, grains (including wheat) and a variety of dairy products like egg and milk. 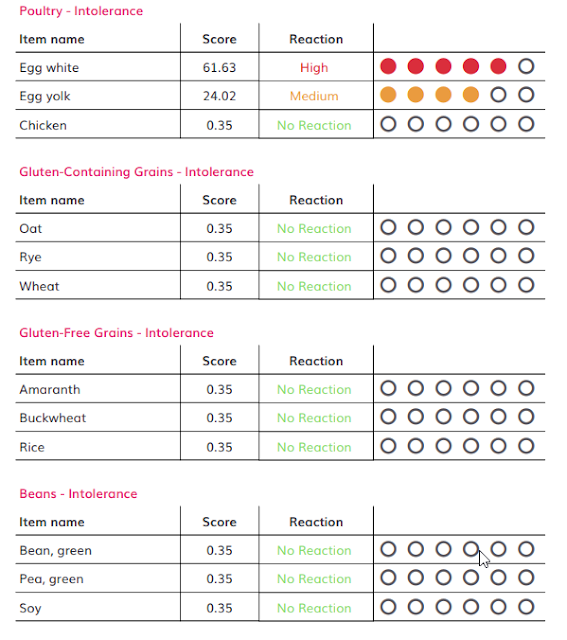 They also have four other at home tests on their site such as a Basic Allergy Test, Complete Body Test, Complete Intolerance Test and a Yes/No Test, all of which have a testing accuracy of 99.8% in their lab. 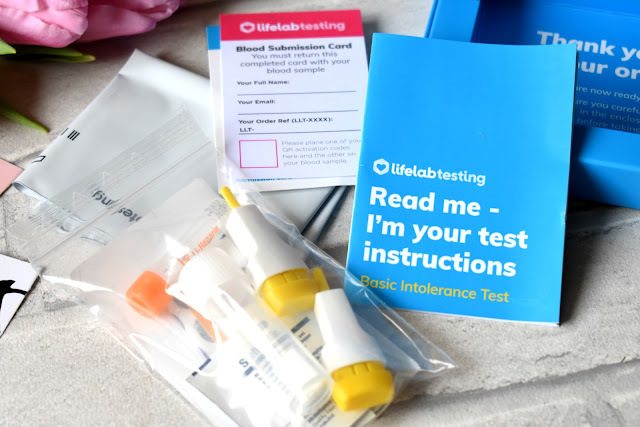 The Basic Intolerance kit includes absolutely everything you need to perform your at home test, theres 1 alcohol wipe, 1 plaster, 1 gauze/absorbent pad, 1 transport tube, 1 microvette 300 ql (sampling tube), 2 lancets, 1 activation card with adhesive label and a free post return envelope. Before taking your blood sample and sending it off you need to activate your test on the LifeLab Testing website, this is so simple to do, you either need to create an account or use your existing account, then follow a few simple steps and pop in your unique Test ID Code which is found on the activation card within your kit-box and voila, it literally took me around a minute to activate mine, it's extremely straight forward and quick! Once your kit has been activated it's time to get your sample on the go, the kit comes with an instruction booklet which I followed precisely, the instructions suggest that the best days to do the test is either a Monday or a Tuesday and to post your sample on the same day that you take your sample. I must admit I did find the 'taking/collecting' my blood quite hard, mostly because my blood didn't want to be spared and my body was being greedy! What I learnt is that you really need to get your blood circulation going, the instruction booklet suggests holding your hand under warm water for a minute and then swinging your arm around in circular motions 5-10 times, I done this and then got my boyfriend to prick my middle finger with one of the lancets after using the disinfectant wipe and hardly any blood came out at all, luckily the kit comes with two lancets so I done it again but this time and I held my hands in warm water for longer and used my index finger which seemed to work so much better. The lancet(needle) itself didn't really hurt at all, I mean obviously you feel it but it's not a painful experience and its over within a second, once the blood droplets start forming you need to scrape them/drop them straight into the blood collection tube until it reaches the 30μL mark, it MUST reach this mark otherwise the blood sample cant be tested. I would suggest working quick as my blood dried up super fast so once the droplets form keep massaging your finger to keep the blood flow going. 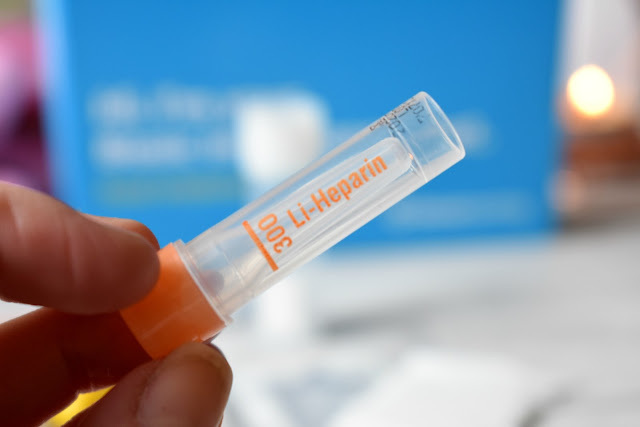 Once the sample has been taken all you need to do is secure the lid, apply the QR code sticker to the blood collection tube so the lab know it’s your sample, then pop it inside the bigger transport tube and seal it up, before putting it into the pre-paid envelope and then post! I'd say the whole process took me around 5-10 minutes from start to finish so it is really quick to do! Your results should only take a couple of days to pop up on your LifeLab account, I literally posted my sample off on a Tuesday and had my results by Thursday so it's definitely a quick turn around! 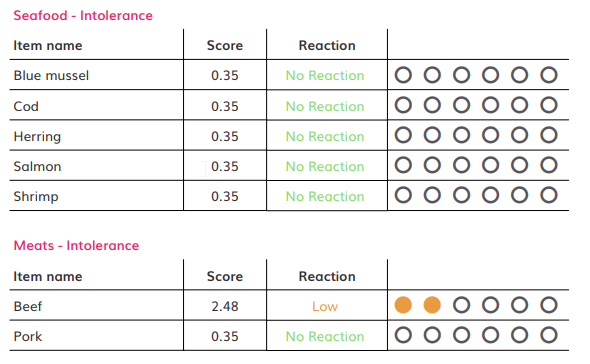 The results are scored out of six in a traffic light style – green means no reaction, orange means a low or medium reaction whilst red means an high reaction. 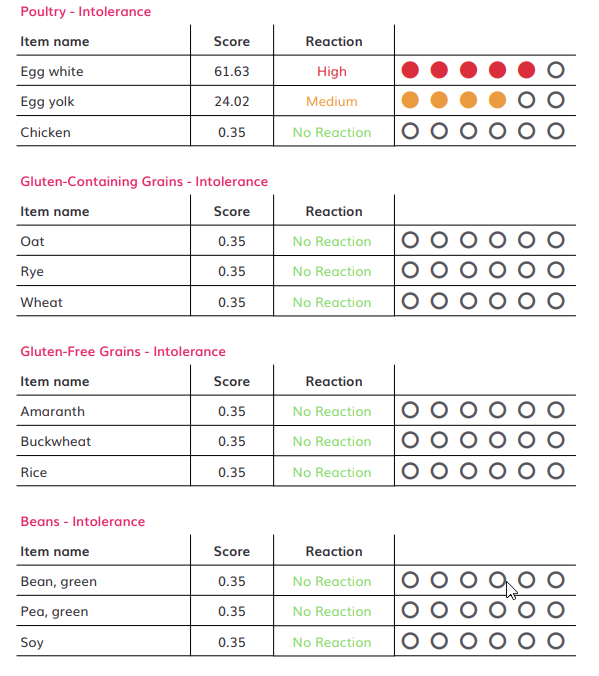 As you can see from my results I have high intolerance to egg white followed by a medium intolerance to egg yolks, this was the major shocker for me because I bloody love eggs and not only do I boil them, scramble them and fry them but I use them loads in cooking and baking! My other high intolerance was mustard, which I actually hate so that wont be a problem for me cutting that out, but eggs could be a major for me! I then have a medium intolerance to sheep's, cows and goats milk, cows milk is something I wanted to cut down on anyway as I thought diary could have something to do with my bloating and stomach pain and after seeing this it's given me the extra push I need to cut down! Hazelnuts, banana and beef where my final readings that are a low intolerance, banana's are one of my favourite fruits so it's quite gutting if they contribute to why I feel crappy sometimes! Overall I'm so happy I got the opportunity to do one these tests and I really cant recommend LifeLab Testing Kits enough, especially if your suffering from migraines, stomach pain, heartburn, excess gas or bloating and nausea and think it might be something so do with your diet or certain foods that you eat, this can give you the clarification you need! I'm definitely going to be cutting out on the food I have an intolerance to and see if I see an improvement in my health! 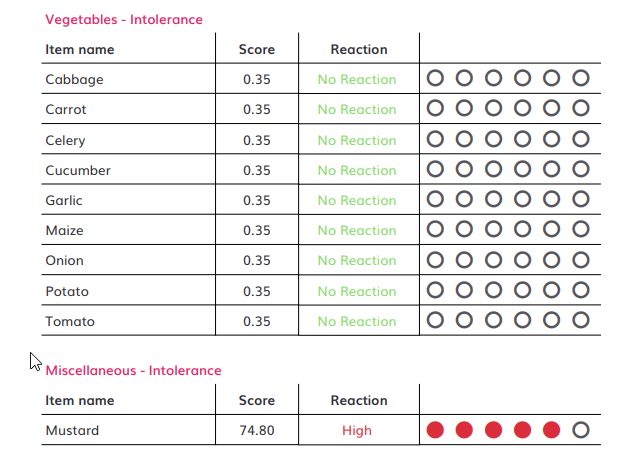 You can find the LifeLab Testing Basic Intolerance Test for £99.00 HERE. *This post contains gifted press samples, all opinions are my own! I 100% need to do this as I struggle with bad acid reflux/nausea on a daily basis and I always wonder if there are specific foods that are triggering it and making it worse, so it'd be super interesting to find out! What I've Watched On Netflix Recently! My First Beauty Wishlist Of 2019! By Terry Ombre Blackstar Cream Eyeshadow Review! CaseApp Review + Discount Code!